FranBlass features various designers and brands and many of the lingerie, babydolls, chemise and costumes are form fitting. Because of this, you cannot go by what you consider to be your normal dress or pant size when selecting plus size lingerie or clothing. We have provided some tips below that we hope will help you with sizing. A unique size chart provided by each manufacturer is attached to all our clothing and lingerie. If we have missed a size chart, please let us know. We sometimes see variations amongst sizes even by the same manufacturer - one product will have one size chart attached while another will have a different size chart with different measurements attached. This proves to be frustrating when shopping for clothing and lingerie both online and in stores because unfortunately, there is no standardization. 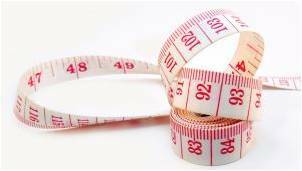 To get the best sizing, you need to know your bust, waist and hip measurements. When measuring your bust, please measure the fullest part of your chest – note that this does not equate to your bra size. Queen Size usually fit most 1X to 3X but what does that mean? Various manufacturers have different measurements. Some say Queen fits 160 to 225 pounds but others like Shirley of Hollywood for example suggest that their Queen Size Hosiery fits from 175 to 275 pounds. If you are in between sizes, it is always better to go up one size. Some manufacturer's products tend to run small while some fit true to size. We will try to identify those. If you are unsure, please don't hesitate to send us a quick email, we'll let you know as much as we can. Keep in mind that how something fits will also depend on the fabric and cut while different body shapes are also flattered by different styles. Two people might be a 2X for example but the style shown in Exhibit 1 fits person A no problems and not person B. This might simply be because person B has a different posterior (what's that, lol? a caboose, a bumper, bum, booty) like mine - really big. I was going to say voluptous but truth be told, it's a big booty! Exhibit 2 on the other hand would likely fit person B (and me) better because it is more flared at the bottom which is more forgiving and provides a more flattering fit. I might still want Exhibit 1 but would likely need to go up a size in order to accommodate... all my assets. This note has been provided because we do get queries all the time about sizing and we wanted to try to answer some questions for you up front. If you have followed the size chart for a particular product and it seems to be way off, please let us know and we will follow-up with the manufacturer. We have also removed items from our shelves based on customers' feedback. It is also important (if you are able) to leave a review about the product on our site as it may be helpful to others when they are making their selections. As plus size women ourselves, we understand the frustrations and will do our best to make things right. Thanks for your time and we hope this helps.